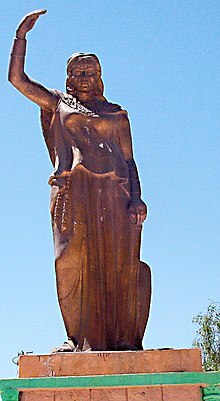 Dihya (Algerian Arabic: ديهيا, Berber: Daya Ult Yenfaq Tajrawt, Dihya, or Damya), was a Berber queen and religious and military leader. She led the native people to resist Arab expansion in Northwest Africa. This happened in the region then known as Numidia, which is eastern Algeria today. She was born in the early 7th century and died around the end of the 7th century in what is now Algeria. This page was last changed on 13 August 2018, at 03:03.